December 16th was the 58th anniversary of my school. 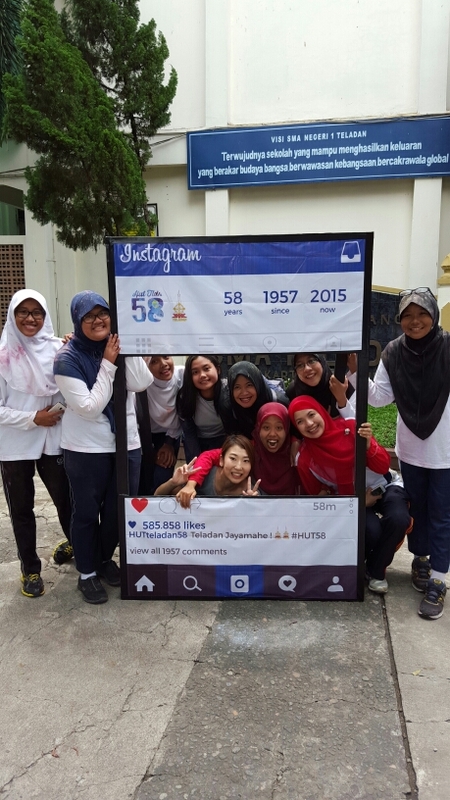 My calendar was marked, and the school was buzzing with preparations for the “ulang tahun” (birthday) of SMAN1. Exams were over, but students were still at school like it was in full session. The marching squad drilled, students sold snacks to fund raise, and a few teachers and I crammed in some intensive gamelan practice for a wayang performance. The day would start out with a super upacara. Upacara is a flag ceremony held every Monday morning in the school yard to raise the Indonesian flag and recite nationalistic pledges. It is taken quite seriously – students stand like soldiers in a line in the school yard and those whose responsibility it is to raise the flag march like nutcrackers. It’s actually quite impressive that they do this every Monday with such diligence, but the upacara on this particular day was going to be the ultimate upacara with Yogyakarta officials present and a special marching routine. Jalan sehat! Literal translation: healthy walk. Will it be a 5k? Will we parade through the city? Will we walk around the block? Who knows. In Indonesia, “jalan jalan” is this wonderfully unbounded term for walking/traveling that has come to mean anything from walking in the neighborhood to traveling overseas. Color wars. A universal good time. 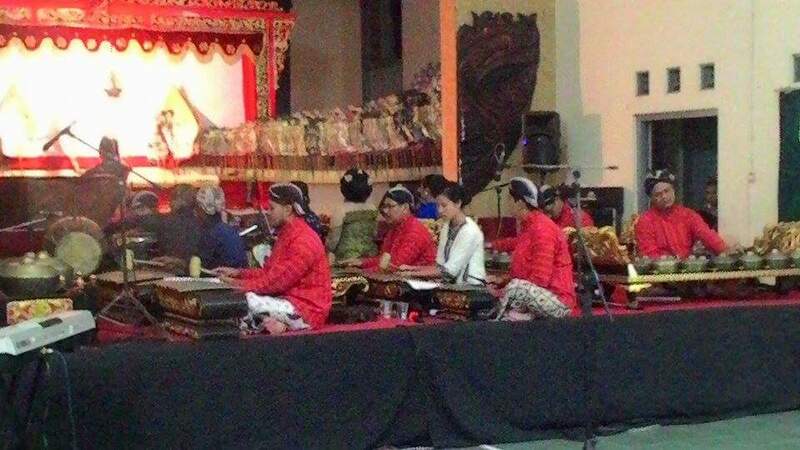 Wayang kulit in the evening – what our weekly gamelan practices had been amounting to this whole time (unbeknownst to me until a week prior). Wayang kulit is a Javanese shadow puppet show that tells the tales of Hindhu epics, and a twelfth grade student who has trained as a puppet master was going to perform for the school. If it sounds like a packed day, it’s because it was. 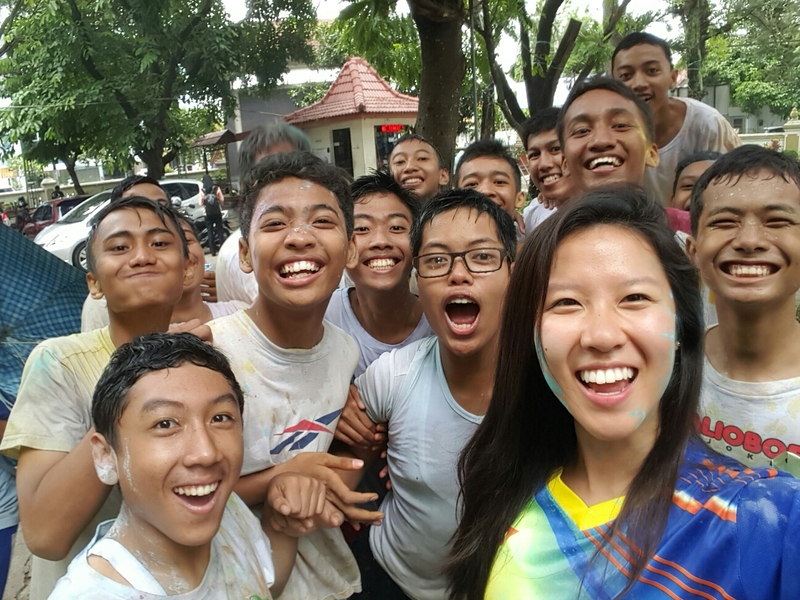 While upacara was full of formalities and declarations, all smiles broke loose once upacara ended and the entire school lined up in parade-mode to walk the streets of Jogja. 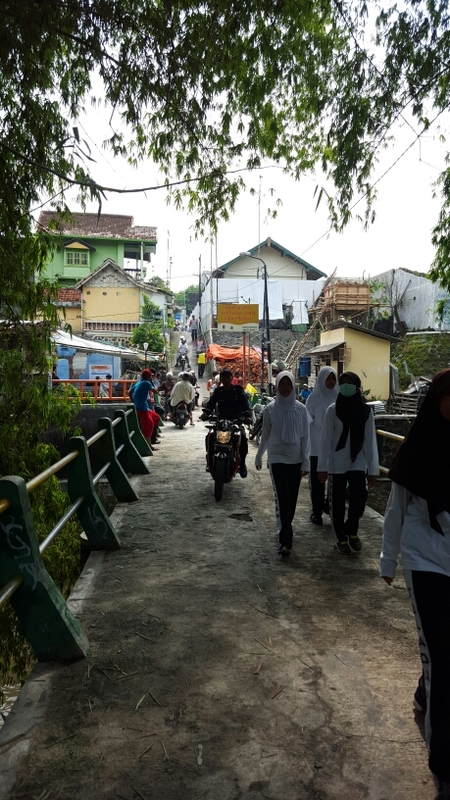 Jogja isn’t the most pedestrian-friendly city, and there were motorbikes whizzing past our elbows as we walked, but walking and talking with students was an opportunity that I’d happily take a puff of exhaust to the face for. As we turned corners and crossed bridges, I got to hear about students’ lives outside of school – their parents, their hobbies, where they were born, how they grew up. 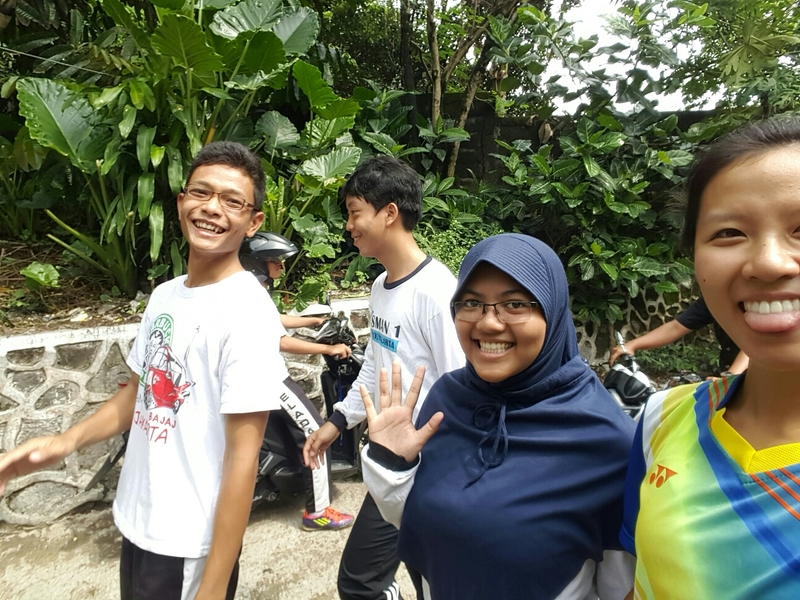 As we walked through quieter neighborhoods, I learned some Javanese as students greeted locals as we passed. The people of Jogja are predominantly Javanese, and while the national Indonesian language is used in the classroom, most if not all students speak casual Javanese to each other when they’re hanging out and speaking colloquially. Javanese is an incredibly complex language that changes based on the level of respect you are speaking with. The language you use to speak to those older than you is a completely different language than the one you use to speak to your peers, and there’s even a level of respect reserved for someone like the Sultan that is another completely independent language on its own. Respect is a huge part of Javanese culture – the Javanese are generally known to be extremely polite to each other, very considerate, and very confrontation averse. Color wars are just as fun halfway across the globe. This particular color war actually did resemble a battle field – for the three seconds in which the two sides of the school yard charged at each other with mouths screaming and fists full of powder raised above their heads, I thought I was watching a scene from 300 except when swords and shields would have collided there were puffs of blues and pinks instead. The girls took the front of the school yard and the boys battled it out in the back. There are few things Indonesians love more than a good old Instagram post and a follow back. 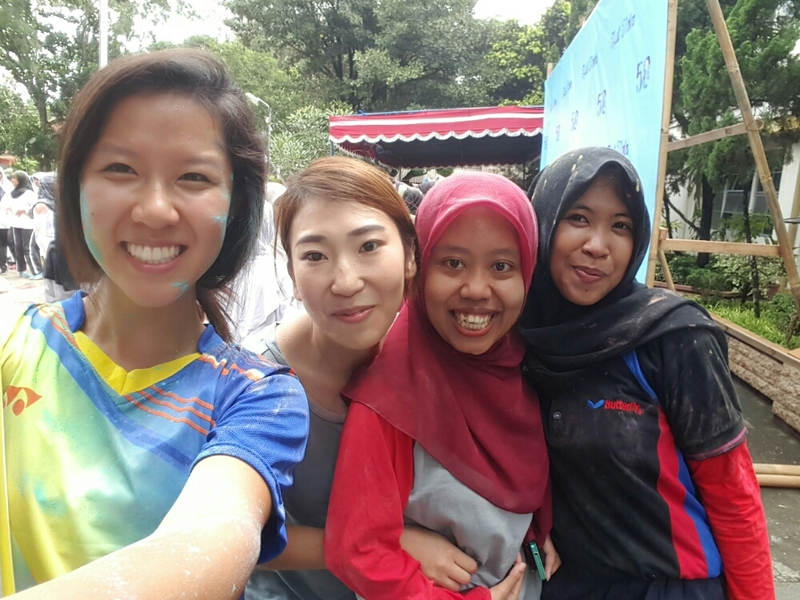 These are some of the teachers that are my age at SMAN1 – a Japanese native speaker and the Javanese teacher. 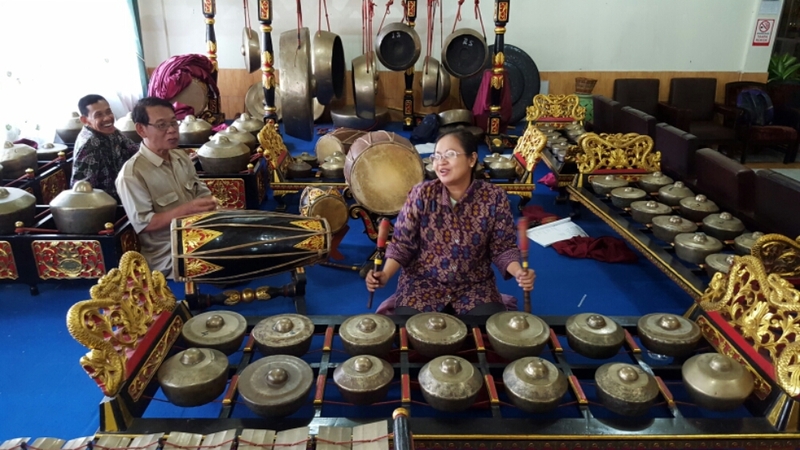 Every Monday, I look forward to gamelan practice after school with the teachers because I love how all the different mellow instruments sound when they’re played together, and I love listening to the teachers joke around in Javanese. For the week leading up to the wayang performance, however, our usual 1 hour-long practice per week turned into 3-4 hour practices every day. It was a gamelan cram session. I was thinking, humming, dreaming gamelan. 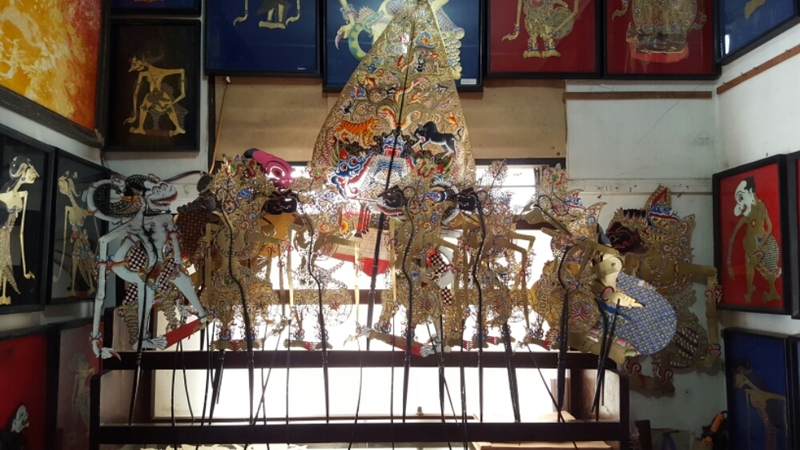 Wayang kulit (shadow puppetry) is an amazing cultural tradition in Indonesia that I had read about before the start of my grant. Kulit means skin, and refers to the leather into which the puppets are carefully chiseled into. The stories are usually drawn from the Hindu epics, like the Ramayana, the Mahabharata or the Serat Menak, a story about the heroism of Amir Hamza. 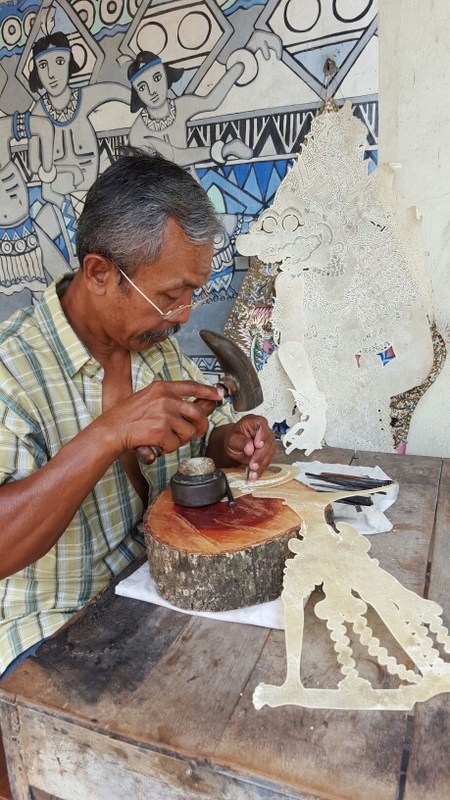 This is a photo from a couple posts back when I had seen a Bapak chiseling a wayang puppet in Taman Sari, the Sultan’s Water Castle. After a month of tap-tap-tapping and subsequent painting, you get a puppet complete with details that will make your eyes twitch. When I imagined a wayang show, I pictured shadows dancing across a warmly lit background. I envisioned characters bopping back and forth to the grand tones of gamelan and a puppet master seated with his hands and arms busy at all times. 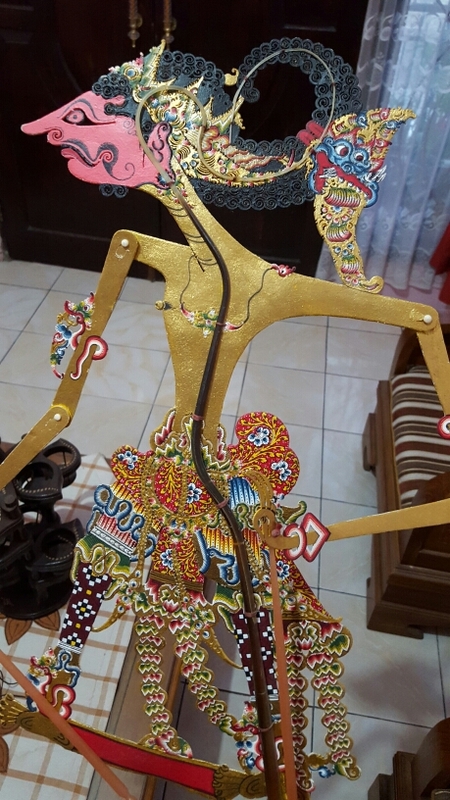 I knew being a wayang puppet master was not easy – there are tons of characters and only two hands – but I definitely didn’t realize that wayang would involve so much more than just his hands. For one thing, his feet were engaged also. He had a cymbal attached to his toes and every time there was a pause in dialogue he would rapidly clap the cymbal against a wooden surface near his foot, almost as if he was creating his own laugh track to fill the transitions. For some reason, it completely slipped my mind that there would be dialogue between the puppets. In my mind the shadows were silent, but in reality, each character had its own voice, and so the puppet master switched back and forth between seven or so different voices. Not only was the student a master of puppetry, but he was a master of the Javanese language, which is essentially a master of three different languages. While most people in Jogja speak Javanese, very few can say that they can speak all three levels fluently. I was extremely impressed. And he was funny!! I would say that this student had the entire auditorium in stitches for a good 60% of the show, which is a LOT of time considering wayang shows typically extend long into the night (I went home at 1am that night, and that was an abridged version). 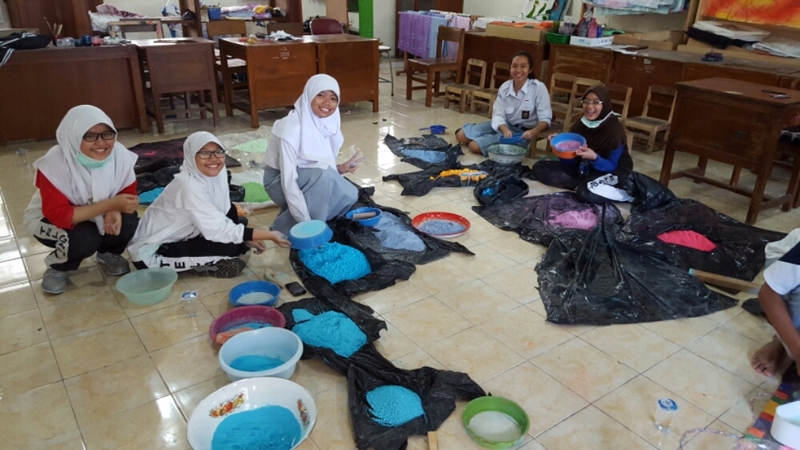 This 12th grade student moved puppets like butterflies flick their wings, had extremely coordinated hands and feet, spoke elaborate Javanese, embodied over 7 different characters, and had a golden sense of humor. It was awesome. I was also sitting right behind him. The gamelan orchestra plays right behind the puppet master to time the songs with the story, and watching the show from “the pit” was like watching wayang in IMAX. It was the biggest dilemma choosing between looking at what I was doing as I played the saron and looking up to watch the puppets fly back and forth. The music stops when there’s extended dialogue, and so I got to sit and enjoy the puppet banter, but the gamelan picks up during the battle scenes of the story, and so it was only when I was able to steal a glance or two in between notes that I saw the puppets twirling and fluttering through the air. The wayang lasted a total of 3-4 hours, and there was this interesting progression of atmosphere in the auditorium as the night stretched on. What started out as a formal performance eventually morphed into what felt like a late night hangout with a talented fellow entertaining a room full of people. After hour 2 or so there was coffee and tea being passed around the gamelan orchestra, and we were stretching out our legs under our instruments during rests. Sometimes the teacher behind me struck up some small talk during an especially long segment of dialogue. Sometimes all the teachers were just bent over their instruments in laughter- the student puppet master even started to incorporate jokes about SMAN1 into the storyline. That night I got to check off one of the highest things on my Indonesian bucket list in the auditorium of my very own school, but I also left with a new camaraderie with the teachers in gamelan that came from hours of rehearsal, hours of performance, and hours of laughter – kind of like that feeling you get when you hike a mountain with a group of friends, and when you return from that adventure you have this new memory you will forever associate with their faces. For me, I’ll always have a mental video reel of flickering wayang puppets, the laughing faces of the teachers at SMAN1, the over-the-shoulder smile as the puppet master looked back after a particularly good joke, the steady movement of wands coming in contact with brass bowls, and the swooping tones of Javanese. If you would like to watch any part of the Wayang Performance, you can find them here!